OMG - how could I forget the BEST ONE?! From one of my favorite new sites, Pizzazzerie. 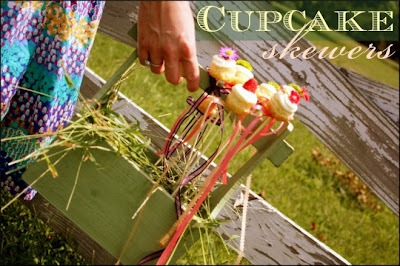 Check them out - you will LOVE them, they are a great inspiration site for entertaining. Have you ever seen something so cute? These are cupcake skewers! Find the full post HERE. I literally squealed out loud when I saw this, Mr. Fo thought I had been bitten by a bug or something. 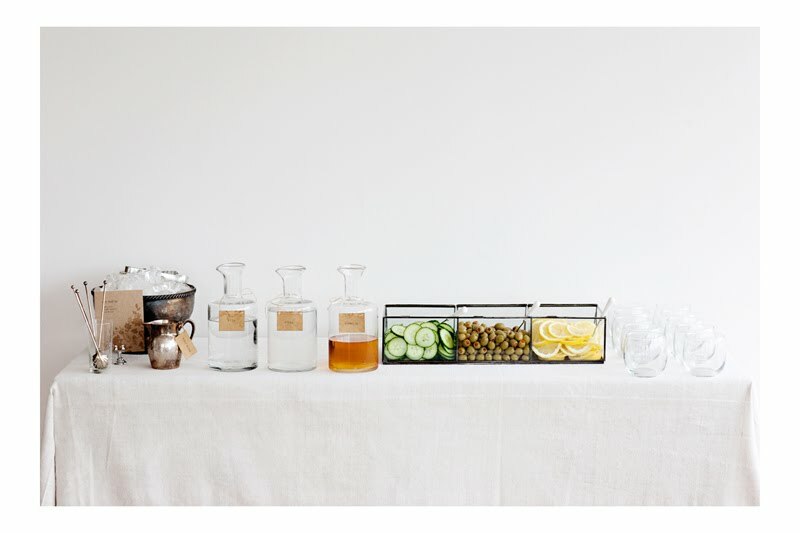 This next idea would be perfect for a Mad Men themed party or any sophisticated party - a Make Your Own Martini Bar from the ultra gorgeous site Sunday Suppers. Subscribe to Sunday Suppers if you want to see something beautiful with every post. 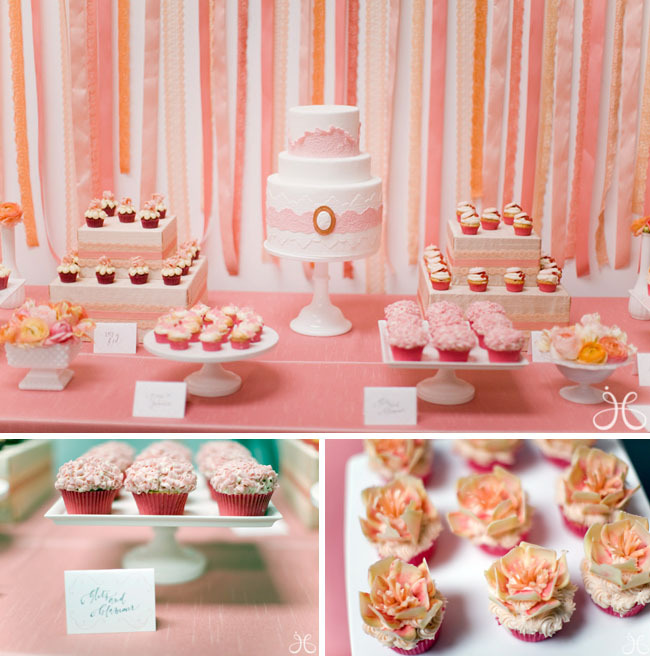 This next swoon-worthy image comes from one of my favorite party inspiration sites, P is for Party. The party is initially from Green Wedding Shoes, another amazing site! 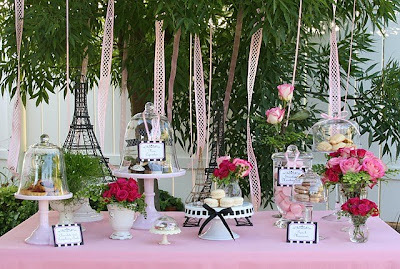 Look at the whole party post HERE, but for now, take a look at the ribbon backdrop behind the dessert bar! I love this simple idea that adds so much color! A dessert bar looks the best when it has a decorative background, and I am planning to use this idea for a shower I am planning. I just love it! 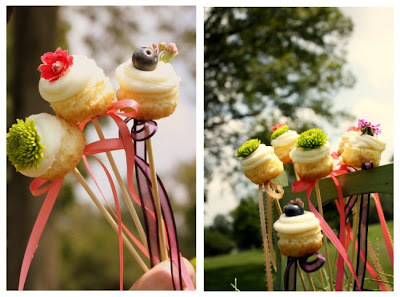 The next stop is something sweet from Glorious Treats, a wonderfully creative blog with mouth watering sweet treats. Everyone loves a hydrangea, right? They are absolutely gorgeous and easy to arrange. Just plop one in small vase and you are done! 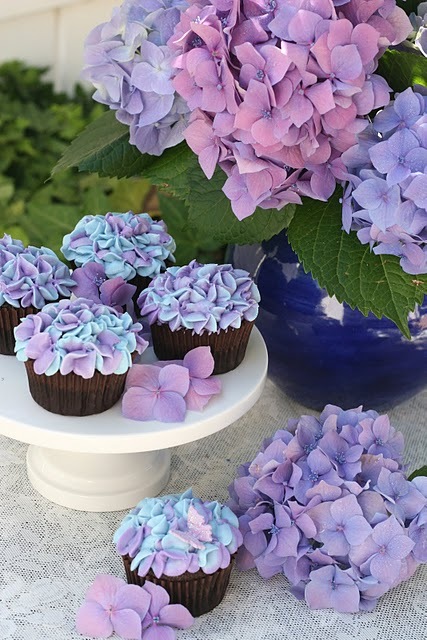 Well, how about a hydrangea cupcake? Can you even tell the difference between the cupcake and the flower? The coolest part is how she used two-tone frosting to pipe out the lovely French Blue color. 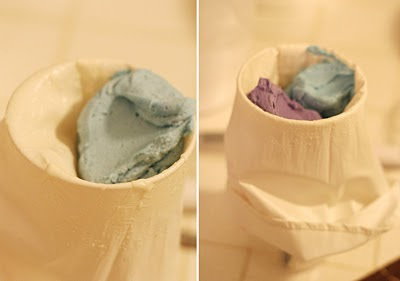 I would have never thought of putting two different colors in a piping bag, but as you can see, it works beautifully! And not to give Glorious Treats all the credit, but something else she posted this week really caught my eye. What can I say, she is just fabulous. You know how if you are a creative person, you have ideas running through your head all the time? 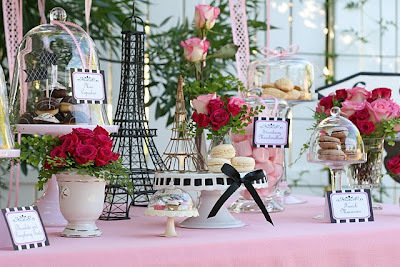 Well Glory from Glorious Treats had an idea for a Paris inspired dessert buffet, so she just created it one day. I love it! Although if I put all of my ideas into action, we would be broke and I would probably be divorced. But maybe I can do just one, like Glory? Please Mr. Fo?! Anyways, please admire her lovely Parisian tablescape. How great are the ribbons hanging from the trees above? What's up with me and ribbon backdrops?! I love the Eiffel sign and the wire Eiffel Towers. It's just adorable and would be perfect for a girls night, bridal shower or a French themed dinner party. Love love love. And finally, to wrap up this post, a gorgeous summer tablescape from Style Me Pretty, featured on one of my new favorite blogs, The How-To-Hostess. 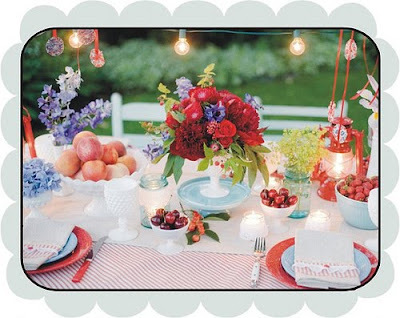 The color combo of red and blue is gorgeous! Wouldn't Glorious Treats' hydrangea cupcakes go perfectly with this table! 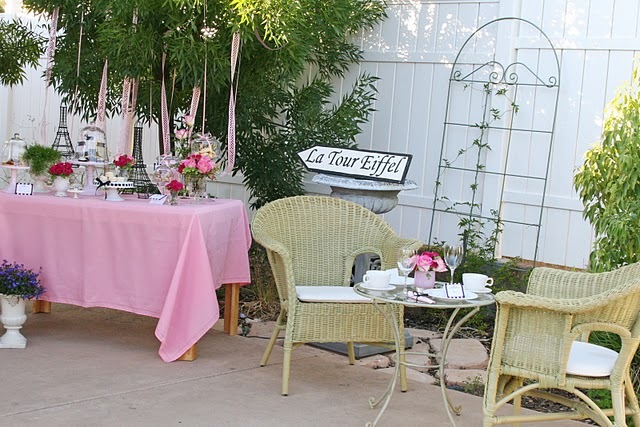 Although the How-To-Hostess makes an excellent point - where are they eating this lovely outdoor dinner without sweating through their clothes? Antarctica? Well, wherever it is, it's gorgeous. Thanks for the shout out, impressive haul of great ideas from the web! Side note-as a consumer of the previously posted Gnocchi and an amateur eater of Italian food (aka Southerner), I found it delicious. Jax is quite the culinary professional and you should all pay her thousands of dollars to cook for you. Those cupcake skewers rock the house! Have you seen the book "Hello Cupcake?" I think there are 2 versions. My mom bought it this weekend, they are so cute. She makes all of her decorations out of candies you can buy at the store. Its not like you need to shape fondant or marzipan. 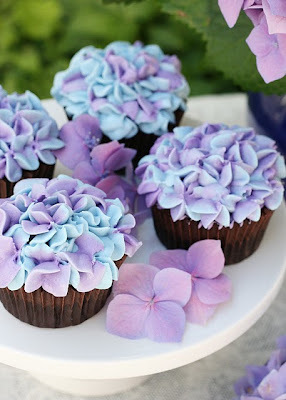 I love the cupcakes - beautiful!